Long time no see, Jacob Ballas! Jacob Ballas Children's Garden - now that's a place that we have not been to for the longest time. I think the last time di-di & I were there was when mei-mei was a newborn and Mummy was confined at home. Gasp, That is almost more than 1.5 years ago! So when we were at Botanical Gardens for the outdoor photo shoot with Danny a few days back, Daddy & Mummy decided to bring us there after we were done. And how happy were we? I guess di-di's facial expression pretty much summed it up. And one also need not guess which area of Jacob Ballas Children's Garden we zoomed in immediately. The water play area! It didn't look as though much has changed since our last visit. But for mei-mei, it was her first time there so yes, delirious would describe her quite aptly. As for us, it was time to get re-acquainted with all the water fountains and jet sprays once more. If only Daddy could stop asking us to pause and smile for the camera. Haha, but he did leave us to play on our own after a while... probably because he was afraid that his precious camera would be drenched amidst our splashing. Splashing, though, wasn't exactly mei-mei's cup of tea too. So she found something easier to handle - a smaller water fountain. And look how happy it made her. As for di-di & me, we continued to hog take charge of the bigger fountains while Daddy & Mummy continued baking under the sun. 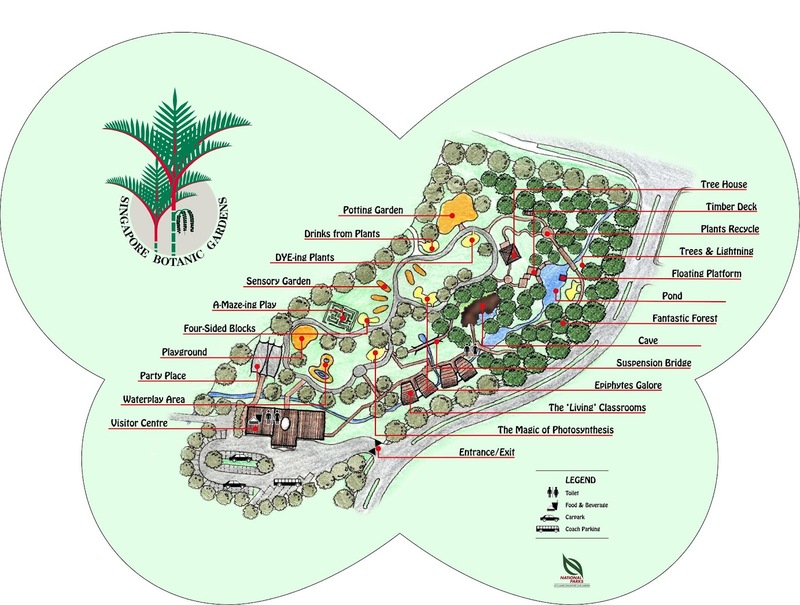 There are actually loads of other fun stuff to do in the Children's Garden, as the map below will show. Stuff like climbing a Tree House, getting lost in a Maze, sprinting across a Suspension Bridge, learning about different plants and how photosynthesis works... and many more! And we would have loved to stay on, but our tummies rumbled. So we had to dry ourselves and head out of the Garden to grab our lunch. Since mei-mei hasn't explored the rest of the other parts yet, I think I shall get her to ask Daddy to bring us back again soon! *The garden is open to children up to 12 years old. All children have to be accompanied by an adult. Enter from NUS Bukit Timah Campus. Turn right into Jacob Ballas Children's Garden after car park gantry. Alight at Eco Garden (North end of the Gardens) via the Botanic Gardens Station.